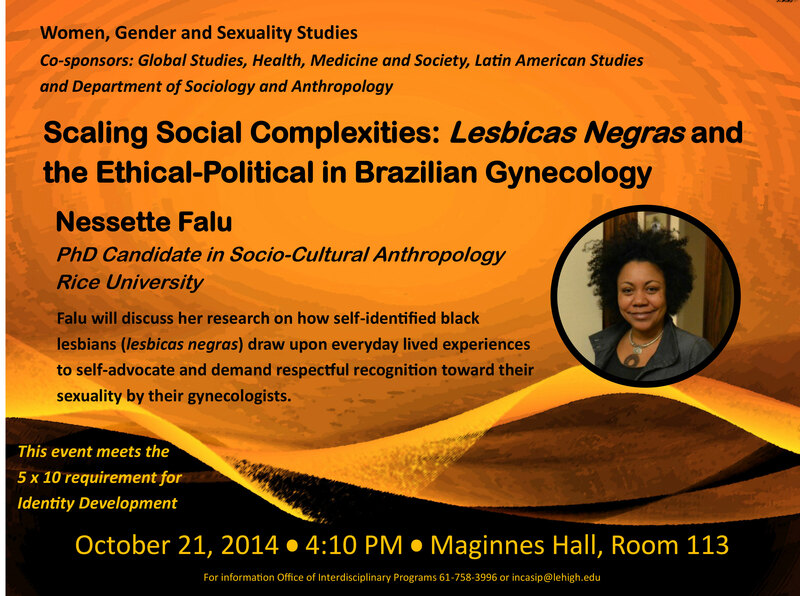 Nessette Falu is a Ph.D. Candidate in Socio-Cultural Anthropology at Rice University. In August 2013, she concluded a yearlong fieldwork in Salvador-Bahia, Brazil. Her research investigates how self-identified black lesbians (lesbicas negras) draw upon everyday lived experiences to self-advocate and demand respectful recognition toward their sexuality by their gynecologists. This study interconnects various angles that pivot the reproduction of “preconceito” (prejudice) such as the socio-political limitations of Brazilian healthcare reform to combat lesbian discrimination, the entrenched prejudicial attitudes manifesting during gynecological exams, and the thriving and transcending ideas of “bem-estar” (well-being) and sexual health, broadly. Her ethnographic study explores and exposes invisible acts of freedom by lesbicas negras. Falu was the 2013-2014 Sarah Pettit Dissertation Fellow in LGBT Studies at Yale University. While at Yale writing her dissertation, she was a mentor to several undergraduate students and delivered the Sarah Pettit public lecture in April 2014. Furthermore, she was an active member from 2008-2012 at the Center for the Study of Women, Gender, and Sexuality at Rice while completing a graduate certificate program. She also worked closely with the Program for the Study of Ethnicity, Race, and Culture that bridges intellectual community and promotes race scholarship and pedagogy. She holds a Masters of Divinity from New York Theological Seminary. She has been a practicing Physician Assistant since 2001 in Neurosurgery, Internal Medicine, and HIV Care. Soon, she will return as Physician Assistant in Oncology at Montefiore Medical Center in Bronx, NY. She is now an advisor to the LGBT Working Group at Lutheran Family Health Center, Brooklyn, NY. She is the recipient of a generous fieldwork grant from the Ruth Landes Memorial Foundation, which included seed funds for media production. She concluded the production phase and plans to complete a short documentary about the lives of some lesbicas negras in Salvador in 2015. Her hometown is New York City, Harlem in specific.